Rumsey Playfield & SummerStage Central Park: What’s Up? SummerStage, perhaps the biggest summer music festival in NYC, kicks off next month with Liam Gallagher, a benefit concert at Rumsey Playfield. Every year, SummerStage brings an array of performers, genres, and entertainment events to venues in almost every borough. SummerStage Central Park, the biggest and most widely attended component of SummerStage, takes place every year at Rumsey Playfield, a small venue/bandshell situated in the Southeast quadrant of Central Park. Since Rumsey Playfield Central Park has been the home to the SummerStage concert series for awhile, the two names have become interchangeable in both advertising and sales, which can prove to be a bit confusing. So for those of you who are wondering about what exactly is up with this hot summer music festival and concert venue, we decided to do the research for you. Here’s the breakdown of Rumsey Playfield, SummerStage Central Park, and the SummerStage Central Park schedule. 2 Rumsey Playfield & SummerStage Central Park Tickets: Is There a Difference? Rumsey Playfield is inside Central Park at 5th Avenue and 72nd Street, the entrance being at 69th and 5th Avenue. From saloon, to casino, to playgrounds, Rumsey Playfield Central Park has undergone quite a few renovations, which would explain why hardly anyone has the details about this location. Aside from the summer months, Rumsey Playfield is just… a playfield. For events such as the SummerStage Central Park concert series, a stage is set up in Rumsey Playfield, thus turning it into a music venue for when it is needed. The bandshell at Rumsey Playfield hardly sees any action outside of the summer months. But when the venue is up and running, Rumsey Playfield Central Park becomes one of the best outdoor concert venues, holding crowds close to 5,000. 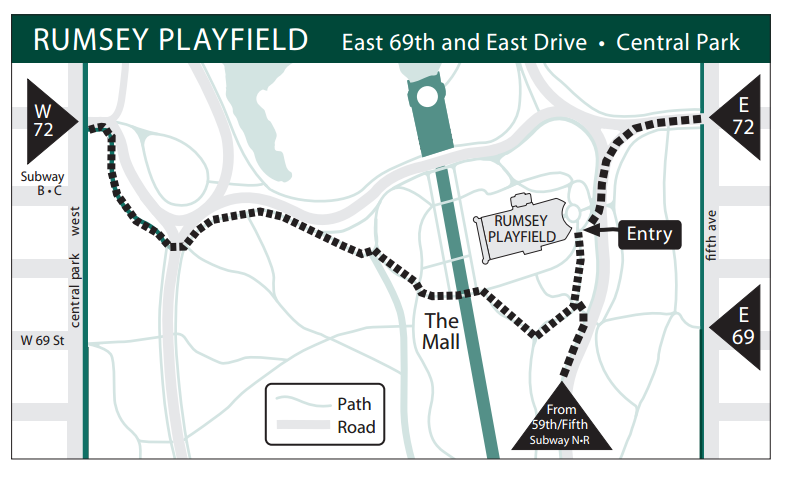 For directions to Rumsey Playfield Central Park, check the map below. Rumsey Playfield & SummerStage Central Park Tickets: Is There a Difference? On Ticketmaster, there are two pages of tickets for the same location: Rumsey Playfield Central Park and SummerStage Central Park. There aren’t any tickets listed on the Rumsey Playfield page, and the events which are to take place in Rumsey Playfield are located on the SummerStage Central Park page. This is incredibly confusing, but for all intensive purposes, the ticketed SummerStage events are typically held in Central Park, and therefore can be found on the SummerStage Central Park page. Note: Rumsey Playfield may hold non-SummerStage Festival events this summer, so when you’re looking for SummerStage Central Park concert tickets, be sure that you’re actually locating tickets for the festival, and not just for a show that is at the same venue as SummerStage. If you’re looking for Rumsey Playfield Central Park tickets of any kind, those related to the SummerStage concert schedule or otherwise, TickPick has them listed all in one place: under the venues name. In our opinion, this is the best way to handle the confusion surrounding Rumsey Playfield. According to the site, you should not bring alcoholic beverages, glass bottles, coolers, pets, bicycles, video cameras, tape machines, or flash cameras to Central Park SummerStage, but food, alcoholic, and non-alcoholic beverages are available to purchase at all shows (food vendors hail in from Smorgasburg). Though Central Park has some pretty stringent rules about what you can and cannot bring into the venue, you may find that the other SummerStage venues have more relaxed policies on what you can bring in, and some will even allow food and non-alcoholic beverages to be brought in. At every venue, the SummerStage support staff will search bags on entry. Pets are not allowed into any shows, but Seeing Eye Dogs are allowed. If you’re looking for the full SummerStage schedule, good luck. The best links we found are through the City Parks Foundation (the main sponsor of the SummerStage schedule), but even these are difficult to navigate. One aspect of the SummerStage music festival is that they bring some of the best free concerts to the city in the summer. But this isn’t made clear on many ticket websites. If you see that the concert is listed as a SummerStage Central Park Benefit Show, assume that this will be a ticketed show. Not all Rumsey Playfield tickets that are listed will be a part of the SummerStage concert series, but if the show is happening during the summer months, the chances are that it is. Below is the schedule we put together for 2018 SummerStage Music Festival, both free and ticketed shows. All SummerStage Benefit concert tickets are available on TickPick for purchase. Planning to attend a concert this year at the SummerStage Festival in NYC? Tweet us @iTickPick and tell us about your experience!